The five-day long orange festival came to an end with the valedictory programme held at Indoor Stadium, Tamenglong on Sunday. Tamei Assembly constituency legislator, Awangbou Newmai, attended the programme as the chief guest. Newmai presented a sum of Rs 5 lakh to the organizing committee of the festival, on behalf of PWD and Rural Development minister, Th Biswajit Singh, who was supposed to attend as the chief guest in the said programme. He also informed that Th Biswajit has assured to construct cold storage facilities in Tamenglong soon under his department. He further assured that road connectivity will be improved and electrification of villages which are yet to be electrified will soon be taken up. He also congratulated the organizing committee, as well as orange growers of the district, for the successful conduct of the orange festival. He also expressed his wish to scale the state level orange festival into a national festival, in the future. 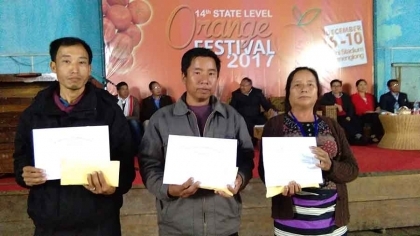 The chairman of the organizing committee, Tamenglong ADC, Namsinrei Panmei, besides donating a sum of Rs 50, 000 to the organizing committee, credited the success of the festival to the orange growers in the district. The chief medical officer, Tamenglong, Dr Chambo Gonmei while proposing the vote of thanks, also announced that the orange queen contest will be held on December 13. In the festival, Gaigupliu was declared the best orange producer and the second position went to David Gangmei while, Tawangkam Newmei and Guingamliu bagged the third spot jointly. The prize for the best orange producer carried a cash reward of Rs two lakh and a citation certificate, while Rs one lakh and Rs 75,000 along with citations each, were awarded to the second and third positions, respectively. Each participant was also awarded a sum of Rs 7,000 each, as consolation prizes. Despite inclement weather, a huge crowd turned up at the closing function of the 14th State Level Orange Festival 2017 which came to a close with the singing of warm Christmas carols led by ‘Christmas Colours’, Tamenglong.